Sergeant Rio Amon-Wilkins, Lieutenant Kenneth Bugado, Chief Harry Kubojiri, Assistant Chief Marshall Kanehailua and Sergeant Regino Saludares display a CALEA logo after the Hawaiʻi Police Department received CALEA accreditation Saturday. 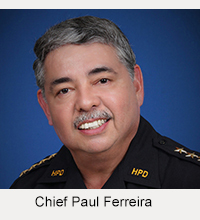 Chief Harry Kubojiri announced that the Hawaiʻi Police Department has been awarded accreditation from the Commission on Accreditation for Law Enforcement Agencies, Inc., (CALEA). Chief Kubojiri was among the police officials who received the coveted award at the CALEA fall conference on November 17 in Jacksonville, Florida. 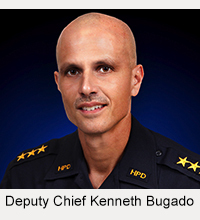 The Hawaiʻi Police Department began to seek accreditation in 2004, at which time personnel started the process of reviewing the department’s General Orders, policies and procedures to ensure they all met CALEA standards. 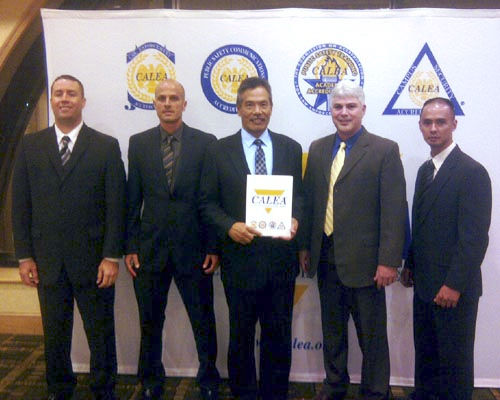 In 2008, the process continued with the creation of the Hawaiʻi Police Department’s Accreditation Section. On May 6, 2010, the department entered the Self-Assessment phase of the CALEA Accreditation process. During this phase, the department had 36 months to complete a self-assessment and schedule an on-site assessment. The on-site assessment was conducted by a team of out-of-state certified CALEA assessors in August of this year. The assessment team visited all district police stations and facilities and examined all aspects of the department’s policies, procedures, management, operations and support services. The assessment team interacted with department personnel by riding along with patrol officers and conducting interviews with sworn and civilian personnel. Various community leaders were also interviewed. The team found that the department was in compliance with more than 400 applicable standards. It was impressed with the department’s commitment to CALEA Accreditation. During the on-site assessment, the team took comments from the public in a public session and by telephone to give residents an opportunity to comment on the department’s ability to comply with CALEA standards. The CALEA Standards Manual was made available for public review. After the completion of the on-site assessment, the assessment team leader prepared an assessment report for the CALEA Commission to review. At the November 17 hearing in Jacksonville, Florida, the commission thoroughly questioned Hawaiʻi Police Department officials. After confirming that the department is in compliance with applicable standards, the CALEA Commission awarded accreditation. Of the roughly 23,000 law enforcement agencies in the United States, only about 1,200 have been awarded CALEA Accreditation. Being CALEA accredited can limit the department’s exposure to liability risk because the accreditation demonstrates that a team of independent outside CALEA-trained assessors has verified that the department meets internationally recognized standards. CALEA Accreditation will also assist in the department’s relentless pursuit of professional excellence and its commitment to providing the citizens of the County of Hawaiʻi with the highest quality of public safety service. To remain accredited, the department must maintain compliance with the applicable standards and undergo a new CALEA assessment every three years. The department’s Accreditation Section consists of a lieutenant, two sergeants and a civilian clerk. Chief Kubojiri praised them for their hard work in helping the department achieve this honored status. “The CALEA staff worked tirelessly for months on end reviewing thousands of pages of documents in a windowless room. Without their dedication to the task at hand, we would not be where we are today,” Kubojiri said. “I also commend all the department’s sworn officers for participating in the accreditation process and for embracing the CALEA standards. Just by going through the process, we are a better police department, Kubojiri added. CALEA was established as a credentialing authority in 1979 through the joint efforts of major law enforcement executive associations such as the International Association of Chiefs of Police (IACP), the National Organization of Black Law Enforcement Executives (NOBLE), National Sheriff’s Association (NSA) and the Police Executive Research Forum (PERF). The goals of CALEA are to improve the delivery of public safety services by developing and maintaining a body of standards, establishing and administering an accreditation process for law enforcement agencies, and recognizing professional excellence in public safety.